I can feel the Breeze Joan! I'm liking simplicity these days too! Joan- so happy to see you creating again. I hope it is like putting an old comfy sweater or pair of PJs. I love purple! This is stunning! Thanks for the inspiration in using the smaller stamps -- I needed a lesson in this. not a purple fan either, but paired with spring green it makes such a pretty card! I think you are as big a fan of Altenew as I am! 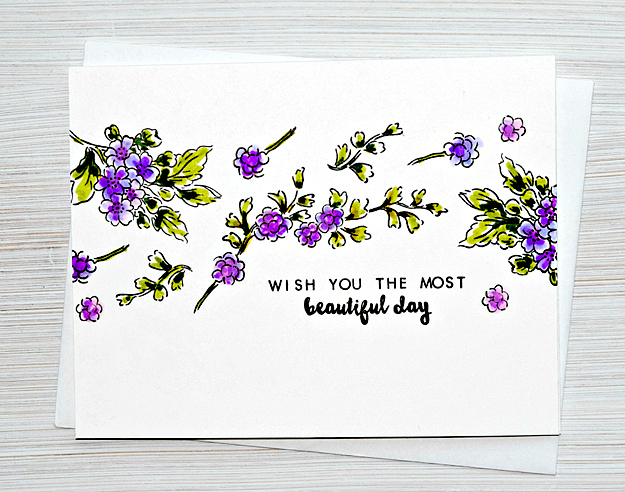 These little flowers are so sweet drifting across your card. The purple is very pretty in small bits with green. It's a color you wouldn't want to go overboard with, but this is just right. I'm not a purple fan either. But your pretty little purple blooms make me happy! Such a sweet card! Love the purple and green together, and simple is wonderful! Purple is a favorite for me. I love the richness of it. This card is so pretty. I hope you are enjoying stamping again. Totally love purple and especially on your card! Thank you for sharing this loveliness with us!